For this Exploring Korean Drama installment, two of our illustrious contributors wanted to share their thoughts on Healer. We both love it so much we’re incapable of talking about it without flailing, thus our Healer recommendation squee post was born. As it’s squee, please forgive any inconsistencies in grammar, punctuation, etc. I’m Angela, I’m a contributing editor for the site and sort of the resident kdrama blogger. And I’m Tatiana, a writer for the site and generally a newbie to kdrama goodness. Before we get started, here’s a run-down of the relevant cast so you can follow along. Maybe I’m called a night errand boy because I dress like I am one with the night. *Seo Jung-Hoo: Works as a “night errand boy,” which means he lives all alone with no connections and thinks he likes it that way, but really he doesn’t. 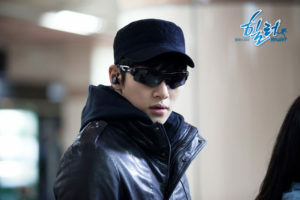 Uses the identity of Park Bong-Soo when working undercover at Young Shin’s company. *Chae Young-Shin: Was adopted at age 8. Works as a reporter for an online news site, has no memory of her past origins. It turns out her biological father and Jung-Hoo’s were best friends in college and were involved in a great tragedy in 1992. *Kim Moon-Ho: Moon-Ho is the younger brother of a third aforementioned college friend. He was around for the events of 1992 but too young to be involved. He used to babysit Jung-Hoo and Young-Shin when they were little, and he kicks off the plot of the show by discovering Young-Shin is his sister-in-law’s long lost daughter. Is a famous reporter. Angela: Joon Hoo is a “night errand boy,” codename “Healer,” that will do anything short of murder/hurting people for anonymous clients with the money to hire him. But really he’s the muscle and hacker ajumma is the boss. And they start getting jobs that open up the secrets of his past. Buuuut that’s not quite why we watch. I was amused that within the world of the show, everyone seems to know what a ‘night errand boy’ is, like it’s a thing. The fated group of friends whose tragedy drives the plot of Healer. Tatiana: I think that one of the better things about Healer is that despite the kind of flimsy premise, it’s presented in a way that it really is believable. I didn’t spend a lot of time going “this would never happen…” the way I might with a less well-developed show. So even though I don’t normally watch kdrama for the plot, I think Healer did give us enough to latch onto. I yelled at the characters to find out the truth and reunite without actually breaking my screen in frustration. Which is all I can ask when it comes to plot! Angela: Really, the healer work is just the premise, because we don’t see him do any unrelated healer work. The real plot is what happened to this older generation, how it has screwed the younger generation, and how they take charge of their lives to bring the events of 1992 to a close and live as they choose. Young Shin’s too busy getting stuff done to deal with your nonsense. On a more flippant note, Young Shin was super cool about Moon ho employing a not-hitman to steal and test her DNA. Angela: Definitely more than I would be. Like that they hid her identity from her for so long. But it’s that resilience that makes her amazing, that she rejects what anyone else has decided for her and does her own thing. Tatiana: I love that it was Young Shin’s coming-of-age story in a large part, too. We see her getting better at her job, we see her family grow from past connections and future ones, and she’s really the driving force in her love story too. Even though Jung-Hoo takes the title for himself, Young Shin is the “healer” of the other main characters, and the most active protagonist IMO. Angela: It’s true; although she was the impetus for Moon ho and Jung hoo to finally act and change their lives, it’s not that she just sits around and lets them do it. She is vitally involved. She’s the strongest, too, and although it doesn’t seem so because she can’t watch violence, I think overall she’s definitely emerged the most unscathed from everything that happened.